The Outdoor GreatRoom Company™ is excited to announce the newly updated Linear Vintage Fire Table. The rustic and shabby-chic look of the table are gaining popularity in both the indoor and outdoor casual furniture industries. 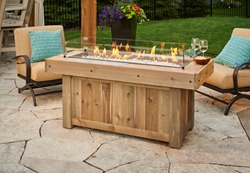 The Outdoor GreatRoom Company™ is excited to announce the newly updated Linear Vintage Fire Table. The Linear Vintage Fire Table joins the Square Vintage Fire Table after overwhelming popularity. A stunning 12x42” Honey Glow Brown color coated stainless steel burner is the star of the table and produces up to 90,000 BTU’s. The table top is made from a distressed wood-look colored tile top. The frame of the top and base are made from a distressed cedar wood that will continue to age beautifully as time goes on. The rustic and shabby-chic look of the table are gaining popularity in both the indoor and outdoor casual furniture industries. The table conceals a 20 lb. LP tank in the base or can be hooked up to natural gas. The Outdoor GreatRoom Company™ (OGC) manufactures unique, upscale products with design appeal for indoor and outdoor living spaces. 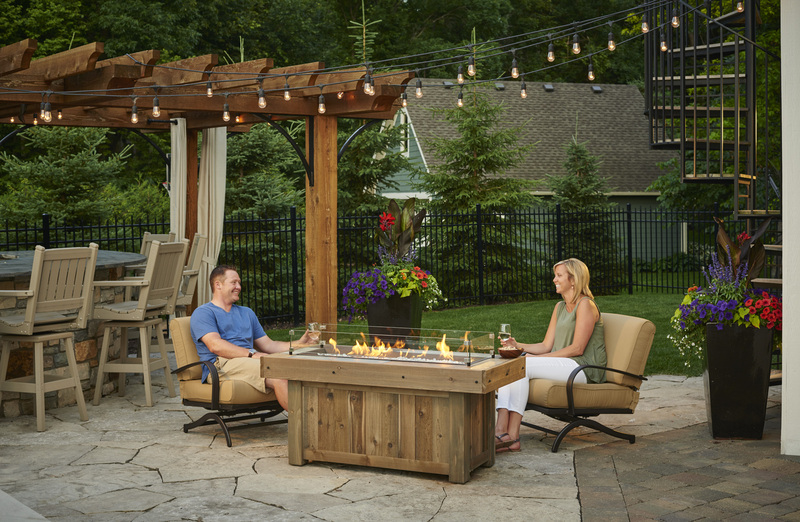 Products include gas fire pits and gas fire tables, pergolas, outdoor kitchen islands, outdoor gas fireplaces, indoor electric fireplaces, grills, outdoor patio furniture and accessories. Visit http://www.outdoorrooms.com for more information.